This is Karisa Wilson. 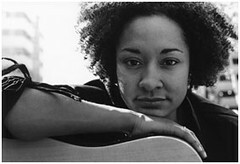 She will be playing a house concert at our place on Sunday April 15 beginning at 7:00 so mark your calanders. Your can read more about her at karisawilson.com and check her out at myspace. She hosts the open mic at Rocky's on thursday nights and she live in our neighborhood. We are doing these house concerts as a way to fold in another layer to the percalating local Grand Rapids music scene. Musicians need a place to play where people are actually listening. The listener actually enables the musician to do what they do. It is a relationship, a give and take, a completed curcuit. Our band will be playing the same night. We will be playing friday the 13th at the Buckam Fine Art Center in Flint MI for an art opening of a group show of artists from Grand Rapids which will include some pieces that Brenda and I have created together. I am inviting you.